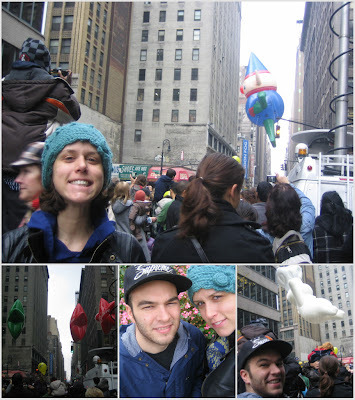 Wellity wellity, this is a little bit late, but TeaBeans wares did make it to the Macy's Thanksgiving Day Parade. We have never been in NYC for Thanksgiving, and I had wanted to go to the parade. We slept in late so I didn't think it would happen, but at the last minute we decided to go. Yay! The parade ends just blocks from the crooked nook so we got there in time to see a few balloons and floats. I may have been overly excited to see Santa. Forgive the hideousness of my face. Late night + no make up = harsh looking Katiebeans. Maybe I will make a TeaBeans ski mask to wear over my face! Forgive the hideousness of my face. Late night + no make up = harsh looking Katiebeans. Have a Holly, Jelly Christmas!